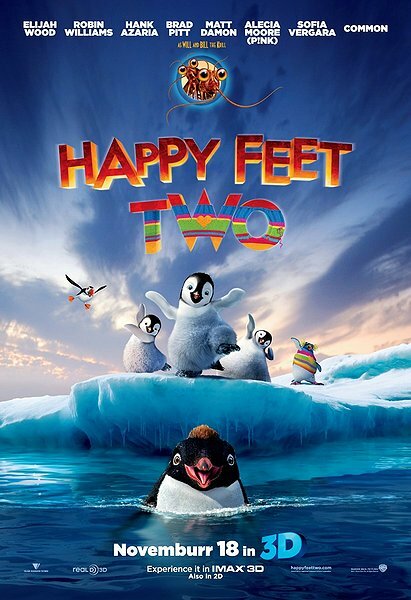 Happy Feet Two returns audiences to the magnificent landscape of Antarctica in superb 3D. Mumble, The Master of Tap, has a problem because his tiny son, Erik, is choreo-phobic. Reluctant to dance, Erik runs away and encounters The Mighty Sven-a penguin who can fly! Mumble has no hope of competing with this charismatic new role model. But things get worse when the world is shaken by powerful forces. Erik learns of his father’s “guts and grit” as Mumble brings together the penguin nations and all manner of fabulous creatures-from tiny Krill to giant Elephant Seals-to put things right. Another disappointing animation movie for kids especially when I have 2 three-year-old with me wanted to leave after 30 minutes into the movie and me kept checking my watch waiting for the movie to end. This is even worse than Puss in Boots, the last animated movie I watched recently. Five years later, I can’t help but felt deja-vu during the movie with penguins dancing/singing to pop songs and not-so-funny jokes from Ramon (Robin Williams). Mumble, however turned into a party-pooper. The only excitement from the movie was from Bill and Will, the krill voiced by Brad Pitt and Matt Damon. Brittany Murphy who voiced Gloria in the original Happy Feet was definitely missed. The original Happy Feet left too huge shoe to fill and I hope the studio should quit while they were ahead. I need some good movie fix. This feels like a movie-slump and I need to get out of it soon. Three new movies kids friendly opening this week “The Muppets”, “Arthur Christmas” and “Hugo”. Hugo probably is the only movie I am looking forward to.